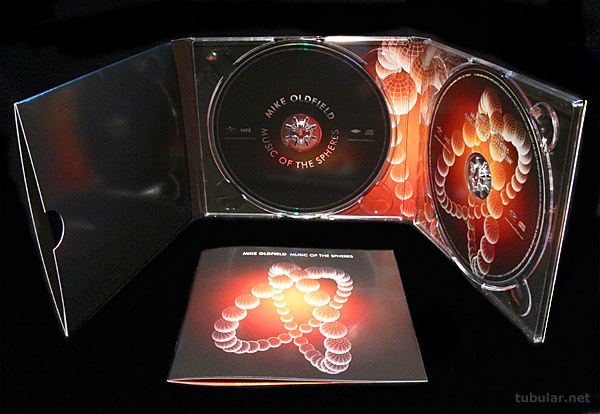 Mike Oldfield - Tubular.net Forums :: Music of the Spheres limited edition - first look! With November 24th fast approaching, curiosity about the new Music of the Spheres 2 CD edition has been growing. Thanks to those nice people at Universal, we can now put an end to the speculation! The set is packaged in a specially designed digipak, with spaces for the two CDs plus the booklet. Behind the two CDs is an enlarged version of the Music of the Spheres cover design. The booklet design is little changed from that the single CD edition, aside from some extra pages of credits for the live recording. We have a picture of the boxed set here. The sound quality of the live CD is a definite improvement over the iTunes edition: full and warm, with much greater presence and detail. Fans of the studio album who haven't heard the live recording yet will definitely find it an interesting listen, those of you who have the iTunes edition already will appreciate the better sound quality of the CD and everyone should be able to appreciate the stylish packaging of this limited edition set! It would of course make the perfect gift for anyone who's a fan of Mike, Lang Lang, Hayley Westenra or Karl Jenkins, but why wait for Santa to bring it when you can order your own copy at Amazon.co.uk or Amazon.com? Fantastic news! Thanks Richard for that! I'm glad they still release these things on cd, but it's probably just because this album is so popular. But we can enjoy better quality! Though a shame that the booklet is brief... I was hoping for some extra footage like pictures or behind the scenes. Can't complain though! Hey! My 1000th post!! woohoo! If i Knew this last November when it was released, NO NO January, Oh Opps no April. I would have not got the CD and waited another 6 months, after all they made us wait the 6 months for the 1st CD. Certainly in the case of the iTunes live edition, I wanted to hear it, so I bought it. I knew there might be a chance that they'd release it again on CD, but I wanted to hear it, and I've been enjoying it since I got it. I could have waited until it was released on CD, but I could have been left waiting for years, or forever...or equally, it could have been just a couple months. On the record company's side, of course, they make the gamble that the fans won't all wait a year before buying the album, knowing there will be a more interesting version around the corner. I can really only say that I like the live recording a lot and that this is, barring a high resolution surround release (the likelihood of that is very low indeed - formats like SACD and DVD-A just haven't proved commercially successful), is probably the nicest release of it there's going to be. Amazon.co.uk is currently asking £11.98 for the 2 CD edition, which I think is a fair price even for one CD (I think I paid more than that in a high street shop for a single disc copy of the album), but of course opinions are going to differ. It's a nicely packaged release...whether it's worth buying is a personal decision! I think the trouble as far as pictures for the booklet goes is that few were taken of the concert. That could have been because of concerns about the noise of press photographers' cameras, or perhaps some kind of restriction placed by Mike, or someone else. Of course, it would have been possible to do something without those, but I suppose they had their reasons for not doing that. Still, I'll make sure it gets passed on that people would like to see that sort of thing in future booklets (and, indeed, that we're willing to help with it). Looking at the pictures it looks like a lot of thought has gone into it so i will be buying it.I haven't actually heard the iTunes version of the live version but it will be nice just to hear Mike playing guitar live again.Been a while since that's happened.I adore MOTS anyway (infact i love it far more than i was expecting to before i got it....very pleasantly surprised as his latter albums haven't really done it for me)so to have another version is a nice prospect. And if the Amazon price is anything to go by then it's more or less what i paid for the original. Any one who still hasn't got the original should definatley but this one. I've just finished listening and have to agree, the CD release of MoTS live at the Guggenheim is well worth a listen. It's uplifting, energising and generally rather cool. To those who have claimed it's the same as the album version: kindly clean out your ears and listen once again, and a little more carefully. This has a different sound - a different energy. It's not without its flaws (there are several glaring mistakes), but it's a great recording which I heartily recommend you consider getting hold of and listening to nice and loudly at your earliest convenience. It's not out yet for another 2 weeks - I thought ?? It's nice to see these positive reactions. I haven't heard the live recording, but I'm pretty excited about it. And I think the packaging is attractive. I'll tell you one thing, if the retailers in North America price it comparatively to Amazon's $33, I will not be parting with the cash. That's highway robbery. That's roughly the same price of 2 separate CD's in just about any store. When you take into account that just about all of us bought the CD, then bought it AGAIN from iTunes for the live content, and then are expected to pay more than, say, $25 or so a THIRD time around is Tricky-Dicky marketing at it's greediest. No way. I love MO, but I'm not too fond of his business associates. What's next? American music companies gladhanding Congess for a bailout like the Detroit auto makers because their own corporate greed killed their industry? Virtually the same day the album is released the flacs will start appearing on the net and that will be good enough for me (certainly better than crappy 160kbps files I bought from iTunes). You want to cure what's wrong with the music industry? That's easy. Make buying the product an attractive alternative to pirating it. It's 2008. There is NO logical reason in the world for a CD to cost more than $10. Want to go further? Raise the cost of writeable and rewriteable media through the roof (does anyone else think it's madness that for the price of a single CD you can buy a spindle of 50 blanks?) Then no one will be in a hurry to do their own rips and burns. Not a rant. Just clear-headed thinking. Noticed in HMV today they ve priced up the Double CD £2 cheaper than the Standard issue..!! Cannt get the Staff I guess lol..
From the iTunes copy I can only hear one goof from Mikes Guitar and that's on Harmonia Mundi. Is the other goof you are referring to on the Tempest? 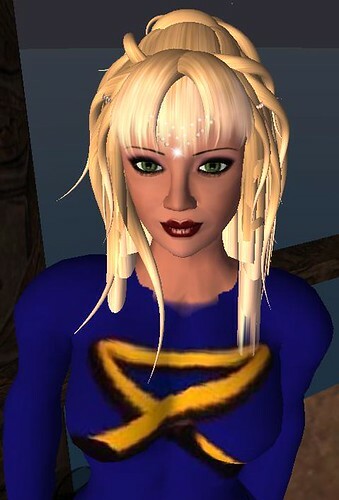 It's in Aurora, the first notes I think they are out of tune... but now again, I am a cloth-eared nincompoop!! I'm really thinking about buying it now.... but if it was a nice LP set I wouldn't think at all. I have it from yesterday and it sounds really good. I had the live part from I tunes but this one sounds better. Now (maybe tomorrow it will be the opposite ! , I prefer the live version, which (for myself) is more "human" and warmer. But the studio cd is musically perfect. So, that's a nice piece for a collection. I'm a little disappointed about the booklet. Nothing new compared the first studio cd. I would have liked to see some pics or words of MO. I have to agree with you Cider about the warmth of the live version. The CD sounds better to me than even the iTunes version. Ever since downloading via iTunes, I've tended to listen to that one. Maybe it's also why I like the original Tubular Bells. The imperfections are indicative of a human behind the work. (-: When I close my eyes and listen to the live version, I am spirited back to an energizing, magickal night in March, when Mike played wonderfully, collaboratively, and when finished, packed up his guitar, threw it over his back, and walked away amidst cheering and heartfelt applause. There are probably lots of such subtleties that separate the live from the studio, and certainly some listeners will have fun finding. I am so glad that everything was left alone. Regarding the booklet, it has a few extra pages because of the second CD and contains one full-page picture of Mike that isn't included in my copy of the studio version's booklet. On the back inside cover the listener is pointed in the direction of classical music: "If this is your first introduction to classical music visit www.classicsandjazz.co.uk for the highest quality downloads and to find out more," anticipating that for some, this well might be their first experience with "classical." One last comment about the booklet....the images are crisper than in my copy of original MotS. Not sure if I'd ended up with a blurrier one or if the new booklets are just sharper. Regarding the booklet, it has a few extra pages because of the second CD and contains one full-page picture of Mike that isn't included in my copy of the studio version's booklet. About the pic... does it come from the promo shoots for MOTS or from the premiere? Hmm.....good question since I don't pay too much attention to his pics. I suspect the promos--think I've seen it before. It is a side profile picture, just of his face, not anything to do with Bilbao.